The Liberal Fire Department responded to a residential structure fire Thursday morning at 802 N. Pennsylvania Ave. The entire structure suffered significant fire, heat, smoke and water damage. One adult female occupant was rescued from the third floor of the residence and was treated at the scene. The building had been divided into several apartments and multiple individuals and families have been displaced by the incident. Investigation efforts have been hampered and will be difficult to complete until the structural stability of the residence can be determined. The fire was reported as smoke from a building by a passerby at 10:51 am. Fire units began arriving on the scene at 10:55 to find heavy smoke issuing from the top floor of the structure and fire venting from the eaves. An adult female occupant was trapped in a third floor apartment and was rescued by ladder. Additional primary and secondary searches of the structure did not locate any additional occupants or victims. Due to the location and extent of the fire, it was not declared under control until 1:37 pm. Mutual aid for firefighting efforts was provided by the Seward County Fire Department. The fire was officially declared to be out at 2:04 pm. Fire units left the scene at 5:35 pm. Also to be recognized for efforts above and beyond the call of duty at this incident are the Liberal Police Department and Seward County Sheriff’s Officers, Seward County EMS, Liberal Building Department and American Red Cross personnel. The cause of the fire is still under investigation at this time. Investigation efforts have been made very difficult by the structural damage from the fire and will be difficult to complete until the structural integrity of the building can be confirmed. With this incident, we would like to issue a reminder to all citizens of the importance of working smoke detectors in the home. We encourage everyone to have working smoke detectors on every floor of the home, preferably near sleeping areas. Change the batteries and test these detectors often to ensure proper operation. Smoke detectors are an easy and reliable way to provide early warning for fast escape in the event a fire should occur in your home. We would also like to remind everyone that a limited supply of free smoke detectors are still available at Fire Station #1 at 110 W. 15th St. or at City Hall 324 N. Kansas Ave. through the “Safe At Home” program. As always citizens with questions or concerns can call the fire department at 626-0128, we will be happy to provide whatever assistance or information that we can. Smoke filled portions of downtown Liberal Thursday morning as a structure fire forced evacuation of an apartment complex at 121 east 8th Street. 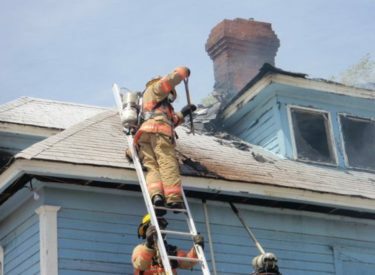 The fire began between 10:30 and 11 a.m. Thursday morning. Liberal firefighters declared the fire under control at about 1:40 p.m. Initial reports indicate no one was injured, but firefighters helped rescue at least one person from the burning structure at 8th and Pennsylvania. We will have an official report from the fire department when it becomes available.